Moosjs.cn is a browser hijacker of a Chinese origin. There is no doubt that it can affect all browsers, except EDGE, so it is not at all surprising that there are so many users’ complaints regarding the presence of this undesirable website. It does not seem dangerous at all at first glance because it contains quick access links allowing users to open eBay, Pinterest, Facebook, Amazon, and other pages quicker. On top of that, several free online games are promoted on the right side of the page. Even though Moosjs.cn looks like a website that can be trusted at first sight, in reality, it is an infection that has replaced yeabests.cc and yeabd66.cc. The majority of people who have discovered this website on their browsers live in India, Indonesia, Egypt, Brazil, and Saudi Arabia. Even though this browser hijacker is quite a new infection (it was first detected on the 22nd of December, 2016), there is a number of infected users already. If you are one of them, go to delete Moosjs.cn as soon as possible. Unlike other browser hijackers, its removal will be complicated. It might really seem that Moosjs.cn is a harmless website; however, specialists working at pcthreat.com definitely cannot call this page trustworthy. Even though it does not look dangerous, it is full of advertisements. Links promoting third-party websites might be found on this page too. Both these promotional links and advertisements are quite dangerous in a sense that they might redirect users to untrustworthy websites that might promote anything. Yes, you might even find malicious software on these third-party websites. Such websites set by browser hijackers also often record what users do on the web. In other words, they seek to find more about users so that more relevant commercial content could be displayed. Believe us; it is definitely not done for your convenience. Instead, the developer of a browser hijacker wants users to click on those ads and promotional links because they get money for promoting third-party websites. There are a number of different browser hijackers spreading through the web these days. Even though Moosjs.cn is one of them, it differs from these ordinary hijackers that only change homepages, search tools, and New Tab pages on all browsers after the infiltration on the computer. Specialists have found that this computer infection uses the Windows Management Instrumentation (WMI) script. In other words, modifications are made on the computer so that Moosjs.cn could be loaded for users when they double-click on shortcuts of their browsers. Unfortunately, this also means that it will be a real challenge to eliminate this computer infection from the system fully. Moosjs.cn is quite a serious computer infection if compared to similar threats. It is because this browser hijacker is usually dropped by a Trojan infection on the computer. A Trojan infection itself might be waiting on websites offering free software. Also, they might be distributed as email attachments. In most cases, they travel inside spam emails. It will become clear quickly if malware promoting Moosjs.cn enters the computer because this web page will become immediately visible on all browsers. Keep in mind - similar threats, e.g. yeabests.cc and yeabd66.cc exist, and they might sneak onto your computer again if you are not careful. Our security specialists do not think that it is a good idea trying to protect the computer from malware without the special tool, especially if a user is inexperienced. Therefore, they recommend installing a reputable security application to make sure that malicious software cannot find any security loophole to get in. Being careful with free applications on third-party websites is also highly recommended. Since Moosjs.cn uses the Windows Management Instrumentation script, it is extremely hard to delete it. According to specialists, external tools are needed to do that. 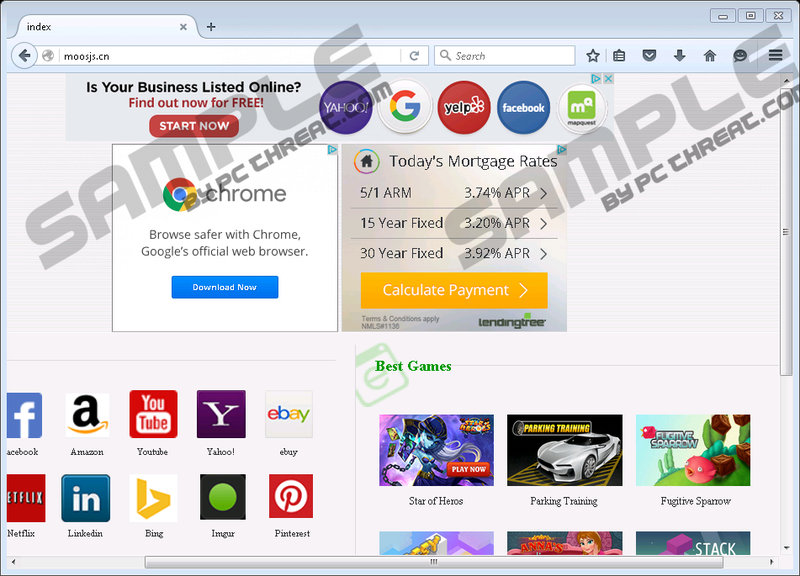 We do not think that you are a very experienced user if you are reading this article, so we do not recommend going to remove this browser hijacker yourself manually. Instead, you should acquire a reputable antimalware scanner, e.g. SpyHunter. It will remove Moosjs.cn from all browsers and will also make sure that a Trojan infection that has dropped this threat on your computer is gone too. Download and install the automated malware remover on your PC. Launch the scanner to clean the computer. Quick & tested solution for Moosjs.cn removal.